If you want to skip airport parking, but don’t want to have to deal with the hassle of cabs, Shire Shuttle Bus has the solution for you. For the past 10 years, we have been operating a Sydney airport shuttle service and helping people just like you get their families or parties to the airport on time, without stress or hassle. Our service runs from the Sutherland Shire to the Sydney Airport—including all international, domestic and Qantas domestic airport terminals. No matter where you’re going, we can get you there in the most convenient way possible. Why should you choose Shire Shuttle Bus instead of a cab or car service, or instead of driving yourself to the airport? There are numerous benefits to be gained from taking a shuttle to the Sydney airport, from logistics to liability and beyond. 1. You’ll have enough space for a large party: If you are catching a domestic flight solo, taking a cab might make sense because you are just one person with just one person’s worth of luggage. For larger parties, though, getting to the airport becomes a logistical battle. Whether it’s a school trip or a family vacation, getting five, 10 or 25 people to the airport together is rarely an easy task. 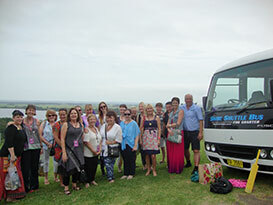 When you hire Shire Shuttle Bus, though, we’ll send a bus with plenty of space for your party and their luggage. Our fleet of six Sydney Airport shuttle vehicles includes three 25-seater Rosa Buses, two 14-seater Commuter Buses and one nine-seater Hyundai Imax. 2. You won’t have to find a place to park: The biggest issue with driving yourself or your family to the airport is dealing with airport parking. Parking at the airport takes extra time and costs extra money—especially if you are jetting off for several weeks at a time. With Shire Shuttle Bus, you’ll avoid the extra expense of parking. Plus, we’ll drop you and your party right at your terminal entrance, saving you the hassle of having to lug your luggage across a massive parking lot. 3. You’ll have a comfortable and relaxed journey to the airport: Departing for a big trip is almost always a stressful experience—especially with a big family or school group. With Shire Shuttle Bus, you’ll enjoy a comfortable and relaxed journey to the airport. Our buses all come with comfortable cloth seats, seat belts, air conditioning and safe, reliable drivers, perfect for alleviating some of the stress or anxiety of travel. Make you next trip to the Sydney Airport a more logistically manageable experience, with the help of Shire Shuttle Bus! If you are interested in booking an airport transfer with us, click here to fill out the enquiry form or give us a call on 1300 857 589.